Our One Owner 2015 Nissan Murano SV AWD in Pearl White offers a blend of upscale amenities, abundant power and complete comfort that drivers like you rave about! Powered by a proven 3.5 Liter V6 that offers 260hp while paired with an innovative CVT to deliver plenty of get-up-and-go. This All Wheel Drive is easy to drive, looks great, and yields near 28mpg on the open road. The sweeping profile of our SV is enhanced with gleaming alloy wheels, roof rails, and the v-motion grille that lets you stand out from the crowd. A haven of comfort and refinement, the interior greets you with a 60/40 split-folding rear seat, dual-zone automatic climate control, and smart design you'll appreciate every time you get behind the leather-wrapped steering wheel with mounted controls! Settle into the contoured zero gravity seats and enjoy technology that is state of the art with voice-recognition, Navigation, smartphone app integration, Bluetooth phone and audio connectivity, a prominent touchscreen, available satellite/HD radio and an iPod interface. Of course, our Murano is well-equipped with a rear view camera, airbags, anti-lock brakes, traction/stability control, and other advanced safety features to provide you and yours with ultimate peace of mind. 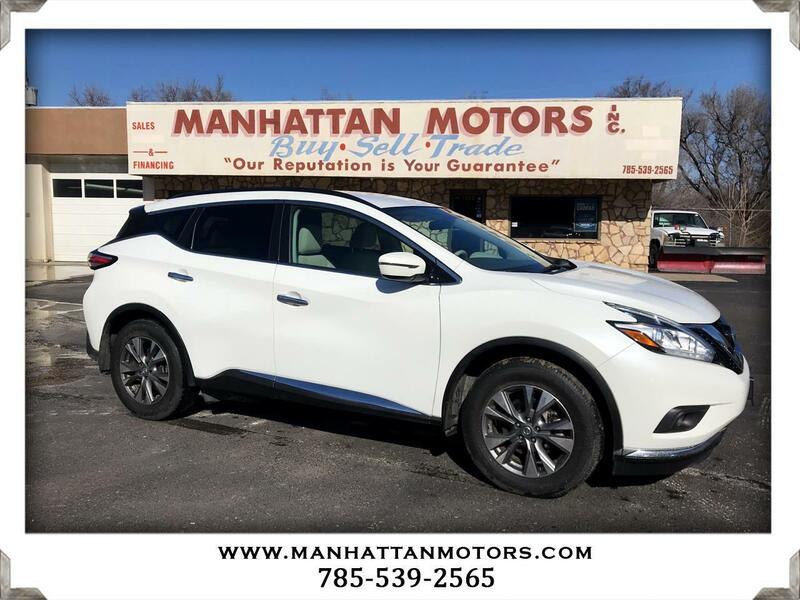 Step up to this Murano, and you'll see it's up for any task with terrific performance and functionality that will enhance your daily routine. Print this page and call us Now... We Know You Will Enjoy Your Test Drive Towards Ownership! Thanks for choosing Manhattan Motors. We recently won The Manhattan Mercury Readers' Choice Award for being the #1 Used Car Dealer. Buyers enjoy our "laid back" approach. No test drive routes or high-pressure salesmen. Our focus is to offer all of the information you need to help make the best decision for your family or business. Each one of our vehicles undergoes a 30-point vehicle inspection by Burnett Automotive, Manhattan's #1 Auto Service Facility. We are also the area's only Independent USAA Certified Dealer, offering discounts on purchases and interest rates.